The flume carries water to the top of the waterwheel to start and keep the wheel in motion. The newest exhibit at the BC Forest Discovery Centre is a wooden waterwheel, located on the lower grounds near the museum's train trestle over Somenos Lake. The new flume and waterwheel replace the previous ones that fell victim to old age and rot. Flumes and waterwheels were used in the logging industry in British Columbia, primarily during the 1800s. Large flumes were constructed and used to transport logs down mountainsides to the lake or ocean below for sorting and milling in the interior of BC. The flume built to run the BCFDC’s waterwheel is significantly smaller, but built using the same design as these larger flumes. 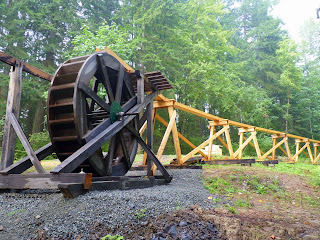 The construction of the waterwheel exhibit adds a new facet to the museum's existing sawmill exhibit, as many sawmills were powered by waterwheels including the original sawmill at the town of Chemainus, located about 16 km north of the museum. The wheel itself was donated by the Cowichan Valley Vintage Machinery Society, while the flume was constructed by volunteers Les Stewart and Ron Poets out of donated yellow cedar. Half the wood for the flume was cut on-site using the museum's 1920s portable sawmill, which has been operational on the site since the mid 1980s. The waterwheel is already running and and being enjoyed by visitors, but is not quite finished. Further plans call for the building of a pump to increase the flow of water traveling over the wheel, and sealing the sides and bottom of the flume to minimize water leaks. Many thanks to Les Stewart and Ron Poets and the other BCFDC volunteers for the dedication and skill they brought to this project!